IF ZARA’S FAUX RICK OWENS SNEAKERS ARE A KNOCK-OFF WHY DO I LOVE THEM SO MUCH? I was cruising Zara today and found these wannabe Rick Owens sneakers. No shade, the inspiration is undeniable. The separated sole, the minimalist instep. We all see it. And were supposed to hate it. Even those of us who would never pay seven hundy for these. Maybe they aren’t worth it to some, others may not dig the style but regardless of how we feel about the original we’re supposed to hate the copy. 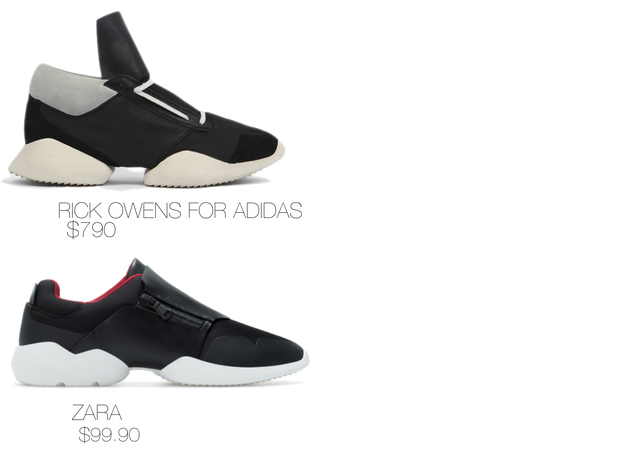 I love me some Rick Owens but I have to say the Zara version is WAY cuter. I’ve seen the RO pairs on some feet, and let’s just say I was not enthused.